There are 800,000 physicians in America and more than 80% believe the Maintenance of Certification process, known as MOC, has no clinical value for patients. For the first time in the history of our profession, physicians have a fighting chance to topple a Goliath-esque organization, the American Board of Medical Specialties (ABMS). A burned-out physician reminds us of the fable about an eagle who believed he was a chicken. When the eagle was small, he fell from his nest. A chicken farmer found the eagle, brought him to his farm, and raised him in the chicken coop with his chickens. The eagle grew up living like a chicken, doing what chickens do, and believing he was, indeed, a chicken. One day, a visitor came to the farm and was surprised to see an eagle --considered the king of the sky-- strutting around the chicken coop, pecking at the ground, and acting like a chicken. The farmer explained that this bird was no longer an eagle, instead he was a chicken because he was trained to be a chicken. The man knew there was more to this great bird than “pretending” to be a chicken. He was born an eagle and had the heart of an eagle, and nothing could change that. The man lifted the eagle onto the fence surrounding the chicken coop and said, “Thou art an eagle. Stretch thy wings and fly.” The eagle looked at the man and glanced down at his home among the chickens in the chicken coop where he was comfortable. He jumped down off the fence and did what chickens do. The farmer shrugged and said, “I told you he is a chicken.” The visitor returned the following day and tried again to convince the farmer and the eagle that he was not a chicken. He took the eagle to the top of the farmhouse and said: “Thou art an eagle. You belong to the sky and not to the earth. Stretch your wings and fly.” The large bird looked at the man and then glanced down at the chicken coop. He jumped onto the roof of the farmhouse and returned to the place where he felt safest. 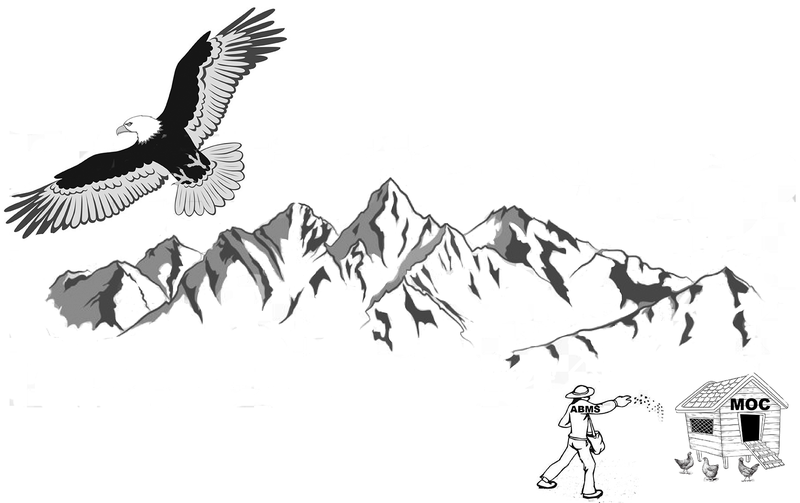 The next morning, the visitor returned and took the eagle and the farmer to the foot of a high mountain. They could not see the farm nor the chicken coop from this new place. The man held the eagle on his arm and pointed into the sky where the bright sun beckoned and said: “Thou art an eagle! You belong to the sky and not to the earth. Stretch your wings and fly.” This time the eagle stared skyward into the bright sun, straightened his body, and stretched his powerful wings. His wings moved, slowly at first, then surely and confidently. With the mighty screech of an eagle, he flew. Because he was an eagle. This past December 2018, four brave internal medicine physicians --recognizing they are eagles-- filed a lawsuit against the American Board of Internal Medicine, the largest ABMS member board, for harm they endured from the Maintenance of Certification process. Practicing Physicians of America has set up a fund to support our colleagues who are fighting this battle and need the support of fellow physicians. Merely 1324 physicians, out of 800,000 in the US, have contributed to the legal fight against the onerous MOC process, despite the fact that it is reviled by the majority of doctors. Physicians members of the American Board of Radiology and the American Board of Physical Medicine and Rehabilitation have filed lawsuits of their own regarding violation of anti-trust laws. Why are so few of our fellow physicians standing up when given the chance? Unfortunately, physicians often choose consistency over happiness. If you’re used to being abused, ignored, or exploited, it’s strangely comforting to remain in the chicken coop and peck at the ground. These physicians are just like the eagle who believed he was a chicken. Maybe physicians prefer the devil they know to the devil they don’t know. Maybe physicians are terribly uncomfortable at the prospect of failure. Maybe physicians believe it is better to control failure than be blindsided by it. Physicians are standing on the mountain and being asked to spread their wings and fly. What is stopping us? The possibilities for the future of our profession are endless if we can win against the American Board of Internal Medicine. If there were ever a time to join the fight, it is now. Surely $100, $200 or even $500 is not too much to contribute to support our talented physician colleagues who have been harmed by MOC. Now we are asking every physician in America, are you a chicken or are you an eagle? Drs Niran and Fisher and unpaid board members of Practicing Physicians of America. Eagles are conditioned to think they are chickens. Ain't it the truth. And the emperor is beating the hens/roosters with a stick without wearing as much as a stitch. Arrogantly they prance about (naked) thinking they are royally clothed and have divine right. Is the ABMS involved in the theft of money and identity? Is the ABMS running high tech sweatshops in INDIA to support their monopolistic products and services? Physicians in the US clinical sweatshops, should do their own MOC research as burnout increases and autonomy has become a long past "FIGMEND" of the imagination! Keep your mouths shut! Slavery is alive and well in the US! Eagle eyes see nothing if they are not open; the human brain becomes a dark follower. Are physicians forced to do MOC by powerful revolving door politicos making markets for financial enterprises who lobby to the tune of millions of dollars every year? Have so-called non-profit corporations of the ABMS franchise turned docs into a penal colonies - laborers working for the British/Dutch testing industry and the American medical industrial complex? "Yes, Virginia", physicians have been transformed into fricken corporate chickens, with a lot of fear and not much spine. And even less time to do anything about it. Sold out by those who should know better. The tweaking of healthcare technology for money and power has already put virtually everyone's records on the cloud, which means health records are available for mass global hacking or data meltdown/catastrophe. Or they can be read by rogue intelligence organizations. (They may be all rogue today.) Isolated theft or loss is a thing of the past. Privacy/autonomy of the patient and physician has been compromised with the electronic health record. Data registries, we are all in them without consent! The MOC mandate/program feeds the corporate Matrix - keeps the dollar theft/data theft alive. Conspiracy theories? Not so fast, it is real even affecting the Dept of Homeland Security! Even the government records of 4-20 million employees including intensive background checks/pertinent medical histories/fingerprints/security clearances stolen and the criminals are still at large today. I have followed Dr. Wes's blog for several years, agree that MOC is seriously flawed and have contributed to support the lawsuit against the ABMS. I am, however, troubled. As a physician, I have taken an oath to put my patients first and foremost. If we demolish the edifice, board-certification, that has largely served us and our patients well, what will replace it? Board certification provides patients with the assurance that their physician has met the minimal (yet substantial) requirements to practice as a competent, qualified physician. It has assured physicians that their colleagues in other specialties have met the same requirements that they had to meet. I have seen first hand the havoc wrought when medical "professionals", including physicians, mid-level providers, and some with no medical training at all, can pass themselves off to the public as qualified physicians. This is rampant in my specialty of plastic surgery. Patients are clueless and their best defense has been to seek out physicians who are board certified. Once board certification is eliminated, as will happen if the ABMS is rendered totally impotent, what happens next? It is easy to take down a bad system relatively speaking, compared to finding a legitimate replacement for it. I hope we are not throwing out the baby with the bathwater. You said: "I have seen first hand the havoc wrought when medical "professionals", including physicians, mid-level providers, and some with no medical training at all, can pass themselves off to the public as qualified physicians." Yesterday, a patient, seen by a nurse practitioner in an outside facilities' ER, was transferred to our ER for overnight observation because of a wide complex tachycardia noted on the monitor. The patient was asymptomatic. Closer inspection demonstrated the "ventricular tachycardia" was only artifact. Needless patient anxiety and expense were accrued. That nurse was "board certified." Well-trained physicians are being replaced by lesser-trained physician "extenders" because they are cheaper and easier to crank out. Don't think for a minute board certification can replace thorough residency training. It is merely marketing accolade.